Why Batman hates Social Media – ¿¡ tjongolongo ?! Ever wondered what superheroes think of Social Media? Illustrator and comic artist Scott Hampson, wondered the same thing. 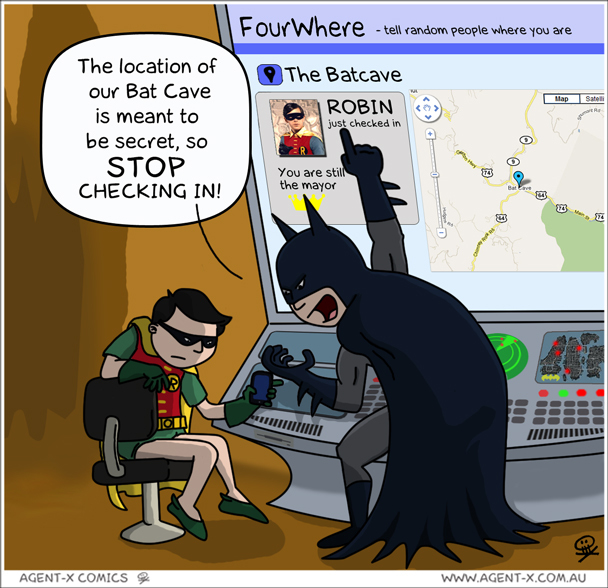 He has drawn a very funny cartoon of Batman and Robin using FourWhere (Foursquare…). Robin keeps checking in in the batcave, something which Batman isn’t too happy about! I love this comic! So simple and sooo funny! !